Or is it called Danger Close? 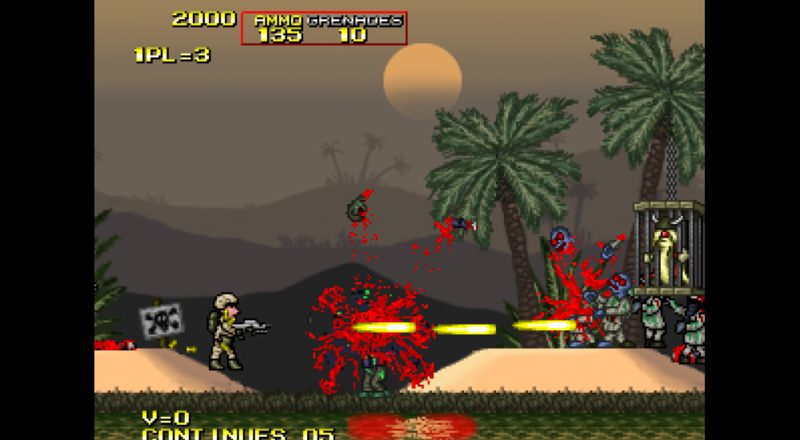 Inspired by the likes of Metal Slug and Contra, Mission: Afghanistan is a sidescrolling shooter with heaps of old school charm. A plane crash strands you deep in enemy territory, and the only way to survive is to grab a gun and start spraying bullets. Sounds like danger is indeed very close. The best part about Mission: Afghanistan is that it supports two player local co-op, just like in the olden days. You and a friend can pick up some insane weapons to help dispatch foes, things like particle flamethrowers, artillery cannons, and a CHAINSAW that's written in all caps. Those vial-tossing mad scientists and armed insurgents don't stand a chance against your mad CHAINSAW skillz. But the giant cyborg scorpion boss and Meka-Saddam? Yeah, they might stand a chance. Better shoot, like, a lot. Even though the game seems to have two different titles, at its core, Mission: Afghanistan knows what it's about. The sidescrolling shooter is scheduled to release at the end of March. A Steam release is expected but has yet to be confirmed. Page created in 1.3586 seconds.